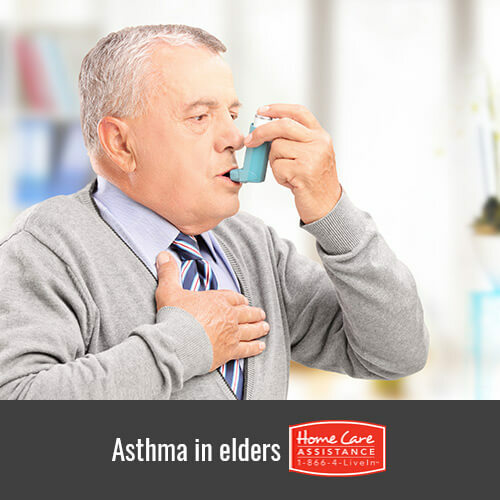 Asthma is a chronic illness that causes inflammation of the airways, which results in extra mucus production making it difficult for seniors to breathe. Among seniors, asthma often goes undiagnosed or mistaken for something else. For Oshkosh, WI, caregivers, learning what triggers their loved ones’ asthma can help. To help ease asthma symptoms, providers of Oshkosh senior care recommend that you ventilate properly whenever you are using cleaning supplies. Visitors should avoid wearing strong perfumes and colognes. Choose air fresheners that eliminate odors instead of using fragrances that mask them as these fumes can trigger an asthma attack. These little guys are hard to see, but they are in every home. Vacuuming and dusting regularly can help reduce the number of dust mites in your loved one’s home. There are air filters on the market that help remove these and other common household allergens from the air and subsequently, your loved one’s lungs. We love our pets, but unfortunately they can be a common trigger for asthma sufferers. Bathing pets too often is bad for their skin and can produce more dander, but with regular brushing you can reduce pet dander. Vacuuming and replacing your air filters with allergen reducing filters can also help. Some areas of the house are prone to moisture, which can result in asthma-inducing mold and mildew. Using dehumidifiers or other dampness reducing products can reduce the occurrence of these unpleasant substances. Keeping the bathroom and kitchen area clean and sterilized will also help to eliminate mold and mildew problems. Smoke is a common irritant that aggravates the lungs. If you or other family members smoke, designate a smoking area away from your loved one. Additionally, fireplaces should only be lit when necessary to avoid excessive smoke inhalation that could irritate your loved one’s lungs. Breathing cold air can be difficult for those with asthma. The sharpness of the winter air can trigger an asthma attack. If your loved one is going out during the winter months, encourage him or her to wear a scarf over his or her nose and mouth to protect the lungs from the cold. If your loved one lives with asthma or other chronic diseases, reach out to Home Care Assistance. We provide flexible live-in and part-time care Oshkosh, WI, seniors need to manage illness, injury and old age in the comfort and safety of home. Contact us at 920-710-CARE (2273) today to learn how our comprehensive services benefit the elderly.